Rheem offers a quality lineup of central air conditioners that offers something for every budget. The Rheem 13AJM Series central air conditioner is a great unit for the value-conscious consumer in a cool climate where a higher efficiency model isn’t necessary. Nick in Escanaba, Michigan wrote to share his Rheem 13AJM Series central air conditioner price and give us some of the details of how he got it installed. We appreciate our readers sending in HVAC prices so others can compare notes. “I’ve got a log home here that I heat with a radiant wood stove since hardwood is so abundant on my 20 acre property. I wouldn’t consider a gas furnace – it just wouldn’t make since. There’s was no duct work in this one-story home since I didn’t ever think I’d want air conditioning. But the last 2 summers we’ve had temperatures over 90 for quite a few days in a row. When your mid-July highs are usually in the upper 70’s, then 90 degrees is pretty uncomfortable. I’ve got a black metal roof on the house to help with snow melting in the winter, and on very hot sunny days it just gets too hot. Long story short, last fall I ran duct work in the basement and cut holes in the floor for registers. Then I bought a cheap Rheem 13AJM air conditioner along with the matching air handler and attempted to install them myself. 13 SEER performance—minimum by today’s standards, but still better than many a/c units in use. Quiet and efficient scroll compressor with R-410A refrigerant. Choice of a steel louvered cabinet or a steel mesh cabinet. Cabinet is powder-painted for durability and appearance. Base pan allows better drainage of condensate so corrosion is resisted. Easy access panel makes maintenance and repairs go more quickly. 10-year limited warranty on the compressor; 5 years on all parts. 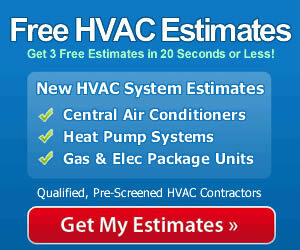 Start with Professional Installation and Save Yourself the Trouble! Nick is like a lot of handy guys who are used to tackling projects around the house themselves. But he’s also smarter than some because he knew when it was time to call the professionals. Include the cost of installation into it when your get central air conditioner prices and you’ll get better performance and longevity from your unit almost every time. Plus, when a qualified contractor installs your HVAC components you’ll have the peace of mind that they are covered by the warranties if anything should go wrong – and that’s not always the case with DIY installations.